ALASKA SENATOR LISA MURKOWSKI, a Republican, repeatedly opposed her party's attempts this year to repeal the Affordable Care Act. But doing away with the ACA's individual mandate, a change included in tax-reform legislation being readied by Senate Republicans, is a different matter. Alaska Senator Lisa Murkowski voted against repealing Obamacare, but strongly favors repeal of the individual mandate. A majority of Americans share those views. 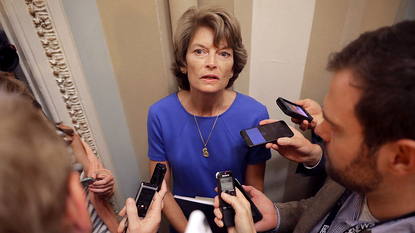 "I have always supported the freedom to choose," Murkowski wrote in an op-ed for the Daily News-Miner in Fairbanks. "I believe that the federal government should not force anyone to buy something they do not wish to buy, in order to avoid being taxed." Murkowski's positions — unwilling to kill Obamacare but very willing to kill the individual mandate — put her squarely in the mainstream. The individual mandate, unfair and ineffective, has always been the most disliked feature of the law, and not just by Republicans. You can be a liberal Democrat committed to affordable health insurance for everyone and still be against an individual mandate. That was Barack Obama's original position, and he reiterated it often during his 2008 campaign. "If a mandate was the solution," he said in a Super Tuesday interview, "we could try that to solve homelessness by mandating that everybody buy a house. The reason they don't have a house is they don't have the money." It was a good argument then; it's an even better argument now. In 2015, IRS Commissioner John Koskinen reported to Congress, about 6.5 million American households paid the tax penalty for not having health insurance. The fine isn't trivial. Tax filers this year who don't acquire health insurance must pay the government a fee equal to $695 per adult plus $347.50 per child, or 2.5 percent of total family income — whichever is greater. Yet, steep as the penalty is, millions of Americans would rather fork it over than buy medical insurance they don't want or can't afford. Nearly 80 percent of those who paid the fee in 2015 earned less than $50,000. The individual mandate amounts to a tax on low- and middle-income families. And it would be whacking considerably more than 6.5 million households (the number of uninsured is about 28 million) if not for all the "hardship exemptions" included in the ACA. For example, anyone who is homeless or recently faced eviction or foreclosure is not required to obtain insurance. Neither are taxpayers who experienced domestic abuse, filed for bankruptcy, had a utility shut off, or went to prison. With Obamacare's hefty subsidies, Congress has underwritten many people's purchase of health-care plans. But it has also wrecked the individual insurance market, causing premiums to skyrocket and competition to collapse. That may not be a salient issue for the 82 percent of Americans whose insurance comes from their employers or through Medicare and Medicaid. It's a huge issue for those with no insurance recourse other than the individual market, and who don't qualify for (or know about) the exemptions from the mandate. In Murkowski's words, "there are many for whom this law has not been helpful" — those who make "the calculated risk to go without insurance and pay the tax . . . They prefer to take a gamble, pay for care out of pocket, and hope nothing too bad happens because the insurance available to purchase is unaffordable." For several million American families, the mandate penalty is a perverse bargain: Better to pay the IRS a stiff fine that nets them nothing than to pay many thousands of dollars in premiums and deductibles for overpriced insurance. 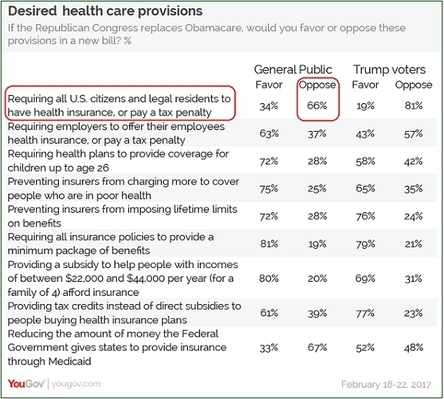 The individual mandate — buy health insurance, or pay a stiff penalty to the IRS — has consistently been Obamacare's most unpopular provision. The argument against repealing the individual mandate is that without a law corralling healthy Americans into the overall insurance pool, insurers will face a death spiral: Only sick people will have an incentive to be insured, so average payouts for those with insurance will rise, so insurers will keep raising premiums, so even more people will forgo insurance, so costs and premiums will rise even more, until insurers abandon the individual market altogether. But the argument fails on both moral and practical grounds. As a moral matter, it's intolerable to treat citizens as mere instruments of an economic policy. Government has no right to force Americans to engage in unwanted commercial transactions just because that's the only way a Rube Goldberg policy can be made to work. The IRS doesn't penalize taxpayers for not having children, not buying a car, or not going to college. It is unjust to penalize them for not buying health insurance. From that perspective alone, the individual mandate is an outrage. Even as a practical matter, however, the individual mandate has been a flop. Not only does it hurt the working poor, it has done little — as even a key Obamacare architect, Jonathan Gruber, has acknowledged — to boost coverage rates. Universal health coverage may or may not be a worthy goal, but penalizing a small fraction of non-affluent taxpayers is an especially lousy way to pursue it. Obama had it right the first time: Health insurance should be voluntary. Punishing people for not buying something they can't afford isn't good public policy. It's just mean. Congress is divided on the future of Obamacare, but scrapping the individual mandate deserves bipartisan support.